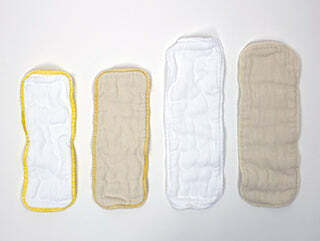 8-Ply cotton diaper doublers made of organic prefold diaper fabric. Sold individually, or save when purchasing in packages of 12. Stock Status: In stock. Usually ships in 24 hours. The same lovely prefold fabric as our beloved Cloth-eez® prefolds in a doubler sizes. All sizes 8 layers (8-ply) of 100% cotton. I love the prefold fabric because it's so soft and pliable. It is quilty just like prefolds are so they come out of the dryer curly and need to be flattened out by hand a bit. This is the nature of the twill prefold fabric. Made of organic cotton is unbleached organically grown cotton. Please wash several times before first use. Absorbency will improve with more washing. This prefold fabric washes very easily and doesn't hold stink because it is 100% cotton. And best of of all, they are very inexpensive. Doublers add additional absorbency in any style diaper. You can fit the size small into any size Workhorse diaper. 100% cotton exclusive of trim. Made in the Pakistan. I love these!! I add one to my daughter overnight diaper and they work like a charm. So absorbent without much extra bulk. Soft, absorbent, good fit, easily washed & dried. Best doublers yet. I really like these doublers. I've ordered 2 dozen large organic doublers, and haven't had any leaks since using. My only issue with them is the quality difference between the two orders. One set still has nice quilting and is soft and straightens easily (bottom), while the other gets pretty bunched and is not quite as soft (top). Not a huge issue, as they both still work fine, I just wish the quality was the same. These are so nice to have on hand for extra absorbency! They are thick but surprisingly don't add too much bulk to a diaper. I love that they're made of all cotton so they are easy to keep clean and fresh. They do bunch up a bit in the wash but as long as you take them out of the dryer right away and straighten them, it's not an issue. I've also hang dried them and that way they stay straighter. These are very absorbent. I like that they are made from same material as prefold. They do bunch up when washed but not excessively and they straighten out quite easily.